The movie musical 1776 was released in 1972 to sub-par reviews but today is remains a standard in movie musical history, even being nominated in 2006 by the American Film Institute as one of the top musicals in American Cinema. Get into the patriotic spirit and see the film on the big screen at The State on July 3 at 7pm to celebrate Independence Day! The film is based on the 1969 Broadway Musical of the same name and focuses on the Second Continental Congress in the summer leading up to July 4, 1776 and how the Declaration of Independence came into existence. Massachusetts Congressman John Adams and Pennsylvania Congressman Dr. Benjamin Franklin coerce Thomas Jefferson into writing the Declaration of Independence as a delaying tactic as they try to persuade the American colonies to support a resolution on independence. As George Washington sends depressing messages describing one military disaster after another, the businessmen, landowners and slave holders in Congress all stand in the way of the Declaration, and a single "nay" vote will forever end the question of independence. As with any historical adaptation, there are always inaccuracies and facts and stories being stretched and molded for the purpose of storytelling. Because Congress was held in secrecy and there are no contemporary records on the debate over the Declaration of Independence, the authors created the narrative based on later accounts and educated guesses, inventing scenes and dialogue as needed for storytelling purposes. Some of the dialogue was taken from words written, often years or even decades later, by the actual people involved, and rearranged for dramatic effect. Exteriors were filmed at the Warner Ranch in Burbank, California, the former Columbia Pictures backlot, where they built an entire street of colonial Philadelphia. The water fountain seen during the musical number "The Lees of Old Virginia,"became known to television viewers as the fountain seen during the beginning credits of the TV series Friends. In its theatrical and original home video releases, the film was rated G; following the restoration of various parts cut by producer Jack L. Warner, the DVD was rated PG. "Cool, Cool, Considerate Men" was cut from the film prior to its release behind the director’s back due to Richard Nixon’s dislike of the political implications of the number. It was restored in later versions of the film. 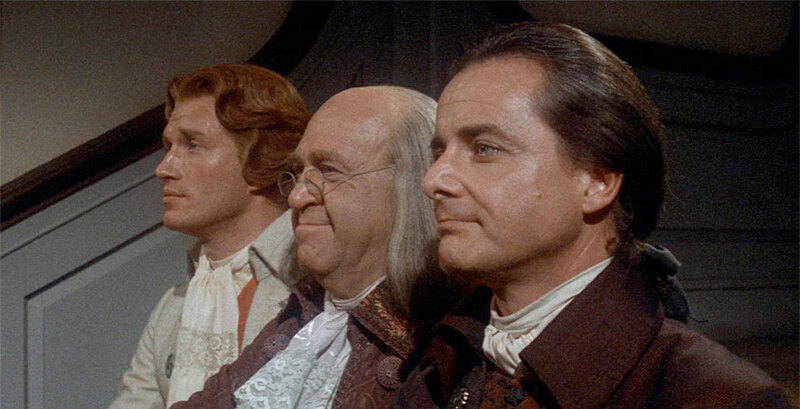 Don’t miss 1776 as part of State Theatre New Jersey’s Free Summer Movie Series this summer on July 3 at 7pm! Join us in the following weeks for our Tuesday showings at 10:30am and 7pm. The lineup for this summer includes Coco on July 10, Despicable Me 3 on July 17, The Lion King on July 24, The Great Muppet Caper on July 31, and Wonder on August 7.